New Delhi is reaching out to nations in the Asia-Pacific more than ever before, suggesting an increased presence in the region. India’s aggressive diplomatic engagement with key Asian partners belies the policy paralysis at home amid a raft of corruption scandals, which have severely undermined the government of Prime Minister Manmohan Singh. Singh’s recently concluded visits to Japan and Thailand on the heels of high-profile visits by the Chinese and Afghan leaders to New Delhi highlight the fact that the government’s ability to pursue a policy of continued engagement with key strategic interlocutors remains unimpeded despite its depleted reservoirs of political capital. After all, India’s outreach to several East Asian countries is raising eyebrows. A case in point were the summit-level talks between Singh and his Japanese counterpart Shinzo Abe in Tokyo last week, which led to the signing of a joint statement that is truly strategic and ambitious in breadth and scope, particularly at a time when mutual wariness of an assertive China is growing. Besides annual summits, a steady growth in political exchange, dialogue and policy coordination such as the Foreign Ministers’ Strategic Dialogue, the Foreign Office Consultations, and the Defense Policy Dialogue have transformed the nature of India-Japan ties in recent years. In addition to bilateral exchanges, Japan and India also held their fourth trilateral dialogue with the United States this May in Washington. In January, Tokyo and New Delhi also held their first-ever Maritime Affairs Dialogue to coordinate their strategies amid aggressive territorial claims by China in the South China Sea and the Diaoyu/Senkaku Islands. No wonder, then, that the growing Indo-Japanese rapprochement has caused deep misgivings in Beijing. On May 30, following Singh’s visit, the Global Times, a Chinese state-run daily, ran an editorial warning India against its growing ties with Japan. “Overheated strategic cooperation with the Abe administration can only bring trouble to India and threaten its relationships with the relevant East Asian countries," it warned. In another development expected to rile Beijing, Thai Prime Minister Yingluck Shinawatra has also expressed an interest in cooperating more closely with India in the realm of defense, including collaboration in production. Moreover, Indian Defence Minister AK Antony has made trips to Singapore, Thailand and Australia this week alone, suggesting that India’s own “pivot to Asia” is a well-thought out policy of engagement and not simply a coincidence or whimsical aberration. Reaffirming this view is the fact that Antony’s visit to Australia will be the first-ever by an Indian defense minister to that country. Incidentally, the visit coincides with the Shangri-La Dialogue in Singapore. Organized by the London-based International Institute for Strategic Studies, the annual dialogue is the pre-eminent forum on security-related issues bringing together defense ministers and other senior military leaders from key Asia-Pacific nations. Last year, it was the venue where the United States formally unveiled its so-called “pivot to Asia” policy – a foreign policy formulation of the Obama administration intended to shore up regional alliances and re-assert America’s intention to remain a Pacific power. Under the plan, Washington seeks to re-deploy 60 percent of its warships to the region by 2020. This includes six aircraft carriers, a majority of cruisers, destroyers, combat ships, and submarines. The new U.S. policy also seeks to deepen ties with traditional allies, such as Japan, South Korea, Australia, Thailand and the Philippines, among others. The policy comes at a time when defense spending in Asia is poised to overtake that of Europe, for the first time in decades. In 2012, China and India announced 11 percent and 17 percent jumps in defense spending to US$106 billion and US$40 billion dollars, respectively. South Korea and Japan also announced rises in defense spending over the same period. Meanwhile, countries in Southeast Asia spent a collective total of US$24 billion on defense in 2012, a rise of 13.5 percent over previous year, with the figure expected to rise to US$40 billion dollars by 2016. The latest Indian policy marks a significant shift from a year ago when New Delhi remained ambivalent about its role in the U.S. “pivot” despite being described as a “lynchpin” in the U.S. strategy by then Defense Secretary Leon Panetta. That Washington remains supportive of broader Indian presence in the region was evident in the speech made by Panetta’s successor Chuck Hagel to the Shangri-La forum on June 1. Following the recent border row with China in April, New Delhi seems to have junked its policy of appeasement towards Beijing. While India will resist from formally joining any formal multilateral platforms aimed at containing China, New Delhi seems to be signaling that it will not be dictated by China in pursuing bilateral ties with countries in the periphery such as Japan, South Korea, Vietnam and Singapore. That India is willing to emerge as a net security provider in the region is also evident in New Delhi’s willingness to consider Afghanistan’s request for military equipment – a policy reversal from its earlier deference to Pakistani sensitivities. Further, ASEAN member countries will welcome India’s proactive engagement, which signals New Delhi’s willingness to shoulder wider responsibilities beyond the narrow confines of South Asia. 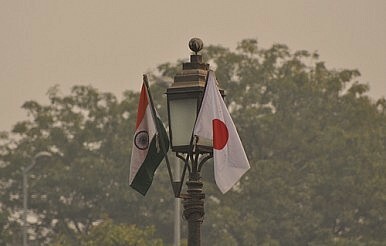 India and Japan continue their strategic convergence.